Sometimes I’m trying to keep track of a million things in my brain and it’s hard for me to think of new ideas. Do you ever have a hard time thinking about new ideas for your sensory table? I made a huge list to help you out. The lists below include filler ideas, additional items that you can mix in with the fillers, as well as ideas for tools and containers to use with the materials. If you mix and match the columns, the possibilities are endless. Wouldn’t it be cool if I knew how to create a sensory table spinner and you could just spin up some combinations? Maybe one day I’ll figure that out. Until then, I have some lists below. If you prefer a printable copy of the material ideas list, I have one of those for you at the bottom of the page. Remember to use caution when selecting sensory table materials for your kids. Some of these materials may not be appropriate for kids under 3 without close supervision. *Make icebergs by freezing large containers of water. Well, I hope that these sparked a few ideas. My personal favorites are the oiled spaghetti, water beads, and lentils….so much fun. 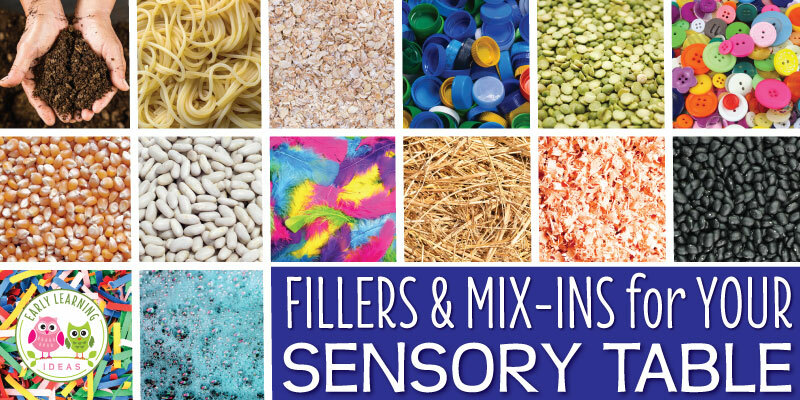 What are your favorite sensory table materials? Would you like a printable copy of the materials listed in this article? Just click on the link below to get it. Do you prefer to not use any food items in your sensory table or bin? I also have a list of non-food ideas for your sensory table. I use all kinds of stuff in my sensory table. Right now we have wheat because we are learning about the LIttle Red hen and going to be making bread.